In what may be the formation of a new breakaway IRA group, a Belfast newspaper was told that IRA units had watched as the peace process failed to deliver, but they had now taken on the mantle of the IRA. “The will of Irish republicans to resist the forced occupation and partitioning of our country has not been defeated,” they said. The Belfast Telegraph said it had seen a statement at a meeting with a representative of the new organisation’s chief of staff. Sentences and paragraphs from the alleged statement have since emerged in newspaper reports. The claims came as a series of attacks, alerts, raids and arrests intensified across the North. In the most serious incident, a PSNI police unit narrowly avoided triggering a trip-wire attached to an improvised explosive device in south Belfast early on Tuesday. It was reported the new organisation is entirely separate from the other breakaway groups - the ‘Real IRA’, Oglaigh na hEireann (ONH), and the Continuity IRA. However, the group was said to be “committed to working with other republicans”. It claimed “the recent execution of the RUC member in Omagh”, a reference to the limpet-mine attack which killed PSNI (formerly RUC) police recruit Ronan Kerr three weeks ago. It also claimed involvement in a similar attack which seriously injured another PSNI man last year, as well as the bombing of the Policing Board headquarters in Belfast 18 months ago. Both of these attacks have previously been linked to the Oglaigh na hEireann group. It had given the Good Friday Agreement an opportunity and had watched to see if “a peaceful route toward independence and national liberation would emerge”. Instead, republicans had experienced “scores of broken promises”. The agreement had not ended British occupation nor created “an Ireland of equals” as Sinn Fein had promised. They said “minimum reforms proposed by Patten”, including and the name change for the police, had not altered policing. The new grouping also claimed that not one security law enacted during the conflict had been repealed and new, even tougher laws on stop and search, and arrest and detention had been introduced. Sinn Fein President Gerry Adams said the reports of the new group were “bizarre”. Neither he nor Sinn Fein had any information about the organisation. “What we can say with certainty is that they are not the IRA; the IRA is history,” he said. He called on anyone with information about the group to pass it to the PSNI or Garda police. News of the group emerged in advance of the annual republican Easter commemorations, although it was not clear if the two events were related. A number of ‘dissident’ commemorations have been held around the country, but for the first time in decades, no IRA group appears to have marked the anniversary with a statement to their supporters. Further commemorations are due to be held on Easter Monday. The Dublin government marked the event with a recitation of the Proclamation of 1916 -- a famous assertion of Irish sovereignty -- inducing cringes in the audience of government officials and members of the public outside the GPO in Dublin. At a Sinn Fein Easter commemoration on Sunday, the Six-County Deputy First Minister Martin McGuinness denounced all dissident republican violence. He insisted the Irish people had united behind the 1998 Good Friday Agreement, supported the 2006 St Andrews Agreement as well as last year’s Hillsborough Agreement. He warned dissident republican groups: “Attempting to overturn the will of the Irish people is not only futile, it is stupid and selfish. “Ireland can now only be reunited by the further development and outworking of the power sharing and all-Ireland institutions which were endorsed by the Irish people in the referendum in 1998. However, he backed the (Provisional) IRA’s campaign, praising those who were involved in it. 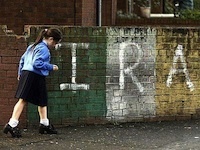 The following is a list of the comments attributed to the new IRA group which appeared in newspapers over the weekend.